FIND yourself a pile-driver and wrap it in silk. That encapsulates the Mercedes-Benz E63 AMG S.
The Mercedes-Benz E63 AMG S has arrived following hot on the heels of its standard E-Class brethren. At just under $250,000, it sits atop the big sedans' tree as the halo performance offering - packing an eye-watering 430 kilowatts and 800 Newton metres of torque under the bonnet. Part of that lofty price-tag is courtesy of the rort that is Australia's luxury car tax, which is a whopping $44,023 on this beast of an offering. Family friendly, everyone can come along for what can be a wild ride. The E-Class cabin is already one of luxury and simplicity, but the AMG makeover adds some extra gloss and sporting showmanship. Open the door and welcoming you is the AMG door sill panels, brushed stainless steel pedals, embossed seats and a topstitched leather dash. Slide your hands over the nappa leather/Alcantara-clad sports steering wheel and you just want to rip into some corners. For those up front, something special awaits the first time you attack a bend. Dynamic seats hug you into place, bolstering laterally where you need it most and then releasing once returning to the straight and narrow. Work worries? Traffic? The front pews also have the solution if you are feeling stressed with a massage function. They can also heat or cool your rear end depending on what takes your fancy. It's a plush-looking cabin, with even the A-pillars and roof featuring the suede materials, with the black colour scheme broken up by chrome highlights and contrasting stitching. The driver has three main gauges, within the central speedometer is a digital display which can show a range of information such as trip and suspension settings. There are dual cupholders in the centre and a deep console. One omission is the space for larger bottles in the doors. Leg, elbow and head room is excellent in the rear, three adults can fit across the back seat - but the centre passenger has to deal with the transmission tunnel. Brutish force is at your right foot's disposal. Delivering 430 kilowatts to the rear wheels is a 5.5-litre bi-turbo bent eight. This thing will launch you from standstill to 100kmh in just over four seconds. It's astonishingly quick and overtaking can be achieved in the blink of an eye. From start up there is a lovely burble emanating from the pipes. But exercise your right ankle and it takes on symphonic proportions. Partnered to a seven-speed automatic box this powerhouse barely raises a sweat at highway speeds. It's not far off idle when cruising at 100kmh. Cruising around town in comfort mode and the E63 can slink around like a run-of-the-mill cruiser. All it takes is some button pushing on the dash to evoke a bitumen-ripping persona. There are three suspension settings that firm the dampers along with four drive modes, turning up the heat from wicked to insane. The easiest option is just to press "AMG", which simultaneously summons sports mode and firms the ride for pure exhilaration. Cornering with precision and also stopping with prowess courtesy of some big Brembo brakes, it is surprisingly nimble for such a large car. Apart from the ability to plough a field, you also receive three-zone climate controlled air con, leather trim with no hard plastics to be seen, 19-inch 10-spoke alloys, panoramic sunroof, Harman Kardon stereo system that can play CDs, DVDs, stream music or play it from a 10GB hard drive, 17.8cm colour display and sat nav. Safety is first class, with 11 airbags, radar cruise control, blind spot warning system and a stability control which can be adjusted to enable you to have fun with a back end happy to step out under power. As expected, there is some pretty refined company, including the BMW M5 ($229,145), Audi RS6 ($225,000) and the Jaguar XFR-S ($222,545). Those parting with this sort of coin probably aren't too concerned about what it costs to keep the E63 on the road. Average fuel consumption of 10 litres for 100kmh is actually pretty good given it's a bent eight and the performance attributes. Servicing isn't cheap though, neither is the replacement rubber, and insurance would be at the higher end of the scale. This is the thinking man or woman's performance car. Excellent space front or back, along with an impressive boot which easily swallows the family grocery shop or three suitcases. While there is no Tupperware hanging off the E63, it does possess enough sporty extras to make its athleticism known. Flared wheel arches, lip spoiler, chromed dual tailpipes, special front and rear aprons along with side skirts that have slick sliver inlays, the Benz brute has got serious presence. What we liked: Brilliant noise under acceleration, raw power, stopping ability, AMG features - especially the dynamic front seats. What we'd like to see: Lower price-tag, maybe four-wheel drive technology like the smaller A45 hatch. 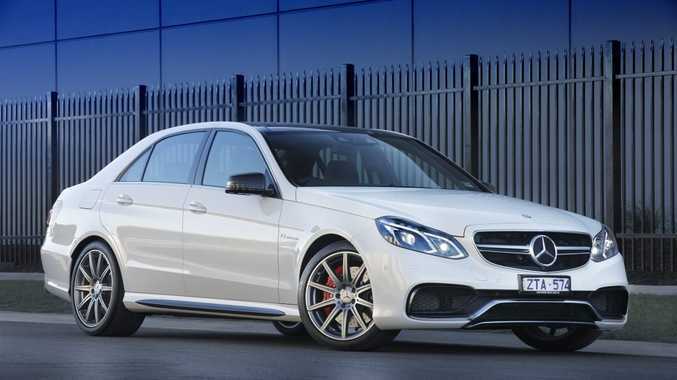 Model: Mercedes-Benz E63 AMG S.
Details: Four-door performance rear-wheel drive large sedan. Engine: 5.5-litre bi-turbo eight-cylinder generating maximum power of 430kW @ 5500rpm and 800Nm @ 1750-5000rpm. Performance: 0-100kmh in 4.1 seconds; top speed 250kmh.